Carolinian Canada, WWF-Canada and VERGE Capital invite you to the 2019 Shifting the Paradigm Forum for a cross-sector conversation on how to accelerate progress towards creating healthy landscapes and resilient communities in southern Ontario, taking place on Tuesday, February 12, at the Royal Ontario Museum in Toronto. Healthy Landscapes & Communities – How can we collaborate to protect nature and create healthy, resilient landscapes where people and nature thrive? Green Investments – How do we use social finance to grow healthy landscapes? 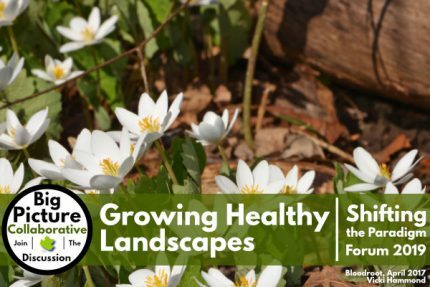 Native Plants – How do we expand the market for locally-grown native plants and support the development of an Ontario native plant seed strategy? Natural Infrastructure – How do we develop cost-effective natural infrastructure strategies that benefit wildlife, water, climate and communities? Engaging Leadership – What opportunities do we have to engage governing leadership in setting priorities to support creating healthy landscapes? How do we develop cost-effective natural infrastructure solutions to benefit wildlife, water, climate, agriculture and communities? For more information and tickets, visit the Carolinian Canada website here.